- You say you love him and he loves you. You wrote it to each other in letters before you were even dating. heck! You even picked out your kids names before you were dating. By the way, you won't be using any of them. I suppose to a certain extent it is true that you love each other in that your relationship started out as a great friendship. Frank will always be your best friend. I will say, though, that the kind of love that you think you feel past friendship is one that will never measure to what God has planned. - Who is God to you right now? I remember how distant you feel from him and you will not believe where God will take you 13 years from now. Today, you are at odds with any and everything from God, school, friends, your parents - all except Frank. God is an empty repeated motion that you give an hour to each Sunday and your heart is far from Him and fully into yourself. The truth hurts. This is a sad time for me to think back on but I am thankful to remember the emotions and thoughts that a young teenager had. You will make bad choices and good choices. You will jump into temptation and avoid it with hot tears. You will be filled with guilt and later freedom through forgiveness. Remember nothing is too big for God and He has you a lot closer to His side than you allow yourself to believe. Nothing can separate you from His love. What is amazing is that God will use Frank to bring you back closer to Him and God will use you to bring Frank back closer to Him too. You will have your hearts filled and plunged into people who need Jesus like yourselves. Who you are now is still part of the person that you will become. Don't allow your weaknesses and sins to plague you with guilt but use your forgiveness as fuel to grace others. - Try your best to not forget these early years. Save the letters, frame the pictures, and keep the ticket stubs so you can walk down memory lane. There is a certain naïvety and innocence that comes with the beginnings of love that you will treasure. Those butterflies you get when you exchange letters in the hallway, the longing to share your every moment, the excitement and hope for the future are a wonderful thing. Continue to spend as much time together (quality time is your love language after all) and when you lose some of that excitement always hold onto hope. Always. - Frank's promise to always be there for you will go to depths that you never imagined. Right now, you are impressed that he will bike 15 miles to see you for a couple of hours (don't worry he'll get his license soon...) and one day he will drive six hours one way in a snow storm from Minnesota to Wisconsin to see you for a day, you will travel the world together and meet family of believers all around the world, he will stay up past 24 hours and coach you on to delivering your first child together, the second birth he will nearly miss! - You say that Frank will be a great Dad someday. He's so natural with kids, right? oh. my. heart. 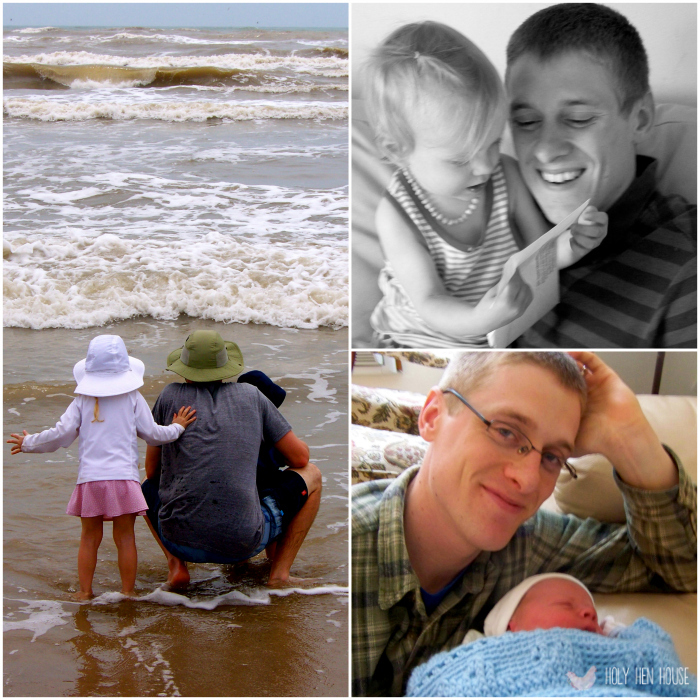 He is an incredible daddy (so far to two!) and watching him love your children will make you love him and feel loved all the more. - You told Frank to never get you flowers on typical occasions like birthdays, Valentine's Day and anniversaries. He will keep true to this and surprise you with flowers at the most random times. One of your favorites will be when he returned from grocery shopping with your two children holding a brighter-than-life neon dyed daisy bouquet shouting out, "For you mommy! Daddy let us pick them out!". Your heart will swell at the letters you find he has written for you even into years of marriage (though he writes more rare now the sincerity is still there) and at the letters and stick figure sketches for your children. - You say you know everything about each other. With time some things are going to be revealed as amazing characteristics from each other but others will shock you to your core and make you question who the man across from you really is. People are continually growing and changing. Keep your eyes on God and pray that Frank does too - there you will find each other at your best. - I can guarantee your relationship will go through changes and challenges for the rest of your life. You may scoff at this as you haven't even had your first fight yet, but overflowing joys and blessings are just about equally paired up with heart break and suffering in life. It's worth it! No matter how hurt you feel, continue to fight for your marriage and Frank because you will grow to understand that a person's sins (including your own) can be their own enemy. Hurt, hatred, and insecurities come from the same enemy that sin does. Satan. Not Frank. Take heart that Jesus has already overcome it all! John 16:33 At the end of the day he will need to hear you say, "I forgive you." and mean it. You will need to hear this from him too. There is no greater gift that you can give each other than Christ's forgiveness. That is true love. If you could write a letter to your teenage self about love what would you include? Share your thoughts and letters below! We would like to pick a favorite and feature it as a separate post down the line.